The Western Yellow Wagtail is a real fan of farmland, it loves pastures. But the Western Yellow Wagtail is a bit picky, it doesn’t particularly care for “green grass factories,” those pastures that are maintained solely for the purpose of generating as much grass as possible. Instead he prefers meadows with wildflowers and orchards. Places where you find flowers, diversity, the same places you find insects. 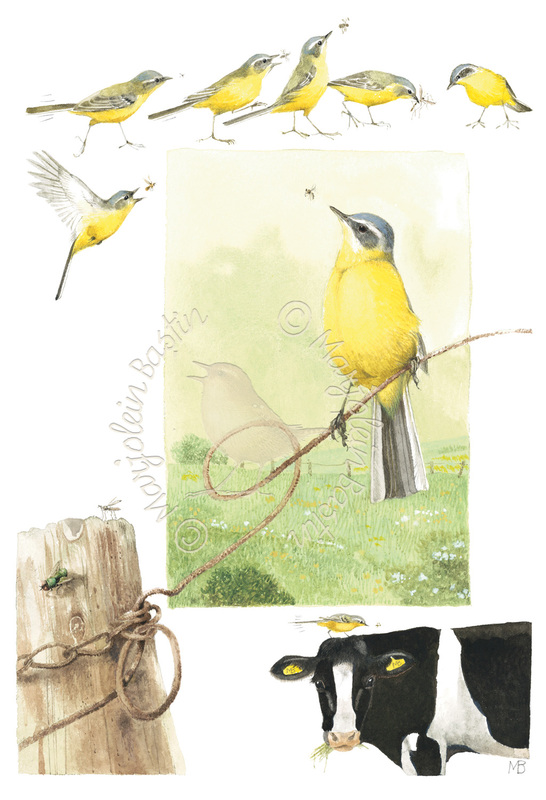 Flies, hoverflies, spiders, beetles and butterflies are normally on the menu for the Western Yellow Wagtail. An optimal meadow for this bird is surrounded by a beautiful green border with trees and shrubs, or perhaps surrounded by a water-filled ditch so there is a healthy variety of water plants. Guarantees for more insects! And it also has great affection for cows; they produce those large patties which attract lots of flies. And also, when the cows walk through the pasture lots of insects fly away to get out of harm’s way. This explains why so often you see the Western Yellow Wagtail fly just ahead of a cow. Fewer cows in the pasture means fewer wagtails as well. But the Western Yellow Wagtail isn’t the only one pleased to see places like that; so are we! They represent a traditional Dutch countryside.